Most people—most of all South Indians—react to this with shock and denial. Some go on and come to terms with it. It’s…surprising then to read K T Achaya’s theory that idlis are a relatively recent introduction to India. He notes that the word might derive from ‘iddalige’, first mentioned in a Kannada work of 920 AD, but the indications are that this was made from an urad dhal batter only. D Balasubramanian had a good report on Dr Achaya’s works in The Hindu and there’s a little discussion on the subject over at Manjunath & Co’s blog. Although two of Dr Achaya’s most well-regarded works on Indian food seem to be out of print, his last book, The Story of our Food is available. Meanwhile, the chillies in the chutney and the tomatoes in the sambar came from the Americas with the Europeans. On pilgrimage to Mecca in the middle 1600s, Baba Budan, a revered holy man from India, discovered for himself the wonders of coffee. In his zeal to share what he’d found with his fellows at home, he smuggled seven coffee beans out of Arabia, wrapped around his belly. On his return home, he planted the beans in the hills of Mysore, India, and nurtured the young coffee bushes that resulted. Coffee flourished in the hills of India – hills now named after Baba Budan. Baba Budan gave his name to a hill in Karnataka, and more recently, spread his seeds wide—to cafes in Cincinatti and Melbourne. Tea? Okay, it was probably grown and consumed in India long before the British came, but you don’t have to be Aakar Patel to accept that tea as we drink it today is largely a gift of British colonial rule. So there’s more than one ‘foreign hand’ in the ‘traditional’ South Indian breakfast. The sugar that goes into it though–we have on Dr Achaya’s authority—is an Indian invention. Bali, Indonesia and Thailand have a surfeit of local folklore and tales that are based on Indian epics and folklore (The international airport at Thailand has a sculpture depicting the tale of Shiva churning the oceans and drinking all the poison — a very popular folklore at least in South India), so Indian foods deriving their origins from those places seems more than just plausible since they seem to have shared common cultural bonds in the past. It would be interesting to visit these places and see whether any cuisine popular over there originated from India in some ancient cultural exchange program when they were all under a common empire or under the control of allies. I meant to say “the ones that DO have foreign origins” — wrote the opposite by mistake. What did we have before Tea and Coffee? While it might be true that Idli has its origins in Indonesia or somewhere else, the logic used to conclude that is very weak. 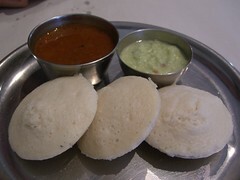 Missing references to Idli in south Indian works is hardly evidence that Idli originated from elsewhere. While missing references argument might be used in a guesswork, it is not acceptable as concluding evidence. At long last, a Sunday Levity item. I thought the Acorn had gotten too serious, Twitter apart. On the topic: Naan came from beyond the erstwhile north-west frontier, pulao and falooda is from Iran, halwa and kababs are Turkish. Chicken Tikka Masala, as we know, is a recent import from Britain. Thanks for that link to The Story of Our Food. Couple years ago I was most distressed to learn that was that mirchi is an import from Mexico. That revelation struck at the roots of my pride in my culinary heritage. One of your links says that Dosai is mentioned in Sangam literature. Wonder if that was with fermentation or not! Old timer : we must be proud that all these various foreign items were adapted in such a way that Indian cuisine still has a very distinct individuality and character ( or is that not true? ). At least, such a thing is true with both Carnatic and Hindustani music – we adopted *scales* from Persians, Turkish etc., imbued them with “gamakams” ( oscillations about notes ) in our own way and formed uniquely Indian rAgas. For instance I learnt with a shock, some time back, that the rAga kalyANi ( yaman in North India ) was classified by the scholar Venkatamakhi as “Turushka” or Turkish, and was hardly given any importance in his early sixteenth century classic “caturdaNDi prakAshikA”, but then within a century Kshetrayya had composed some 20 padams in the rAga ( which meant it had become important ). And if I remember it right, the highly carnatic rAga, tODi, also has foreign origins. This is way better than modern Indian wannabes who merely ape the western culture without putting any of their own originality into it. ( Nitin : sorry for digression ). Hmmm.. where did the curd come from?? It definitely has a genuine flavor to it vis-a-vis yogurt. Isn’t that fermentation technique. I know of traditional hindu religious ceremonies that abhor some of foreign veggies, but is perfectly at home to curd! ‘Indi’-genization of music, food and drinks is in our blood. Look at the violin, the mandolin and the guitar adaptation; not to forget the lip smacking tandoori pizza with paneer toppings! True, coffee could be Arabian, but there is one and only heavenly brew-filter coffee, which comes from adding a bitter flavor to the coffee.